Few of you know the bumpy road that I have traveled in my athletic career over the past 12-15 months. Compiling this road of injury and come back of course has also included the birth of our first child Kennan Wade and of course working 40+ hours per week to keep us afloat financially. I very rarely speak publically about injury or my health but I thought it would be good to share with those that follow, support and continue cheering me on from far away. It was a cold and wet mid morning in March 2017 and I was out for one of my last harder long runs in preparation for the Boston Marathon. The workout was 20 miles with the first 8 miles as a warm up and building into a steady 6:30 pace. I then would run to a track and do 3X2miles at my expected race pace 6:00 or just under. The workout was going well but I was beginning to fatigue when I got to the track and did the first 2 miles in 11:45. As I jogged 400m before the second 2mile it began to drizzle as it often does in Seattle. The next 2-mile was more difficult and I began feeling my groin muscle twinge and tighten a bit but I still came in right at 12:00. As I did my recovery jog following this repeat I began to have a dull ache in my groin that progressively intensified. I still proceeded toward the third 2-mile repeatdespite feeling weakness and discomfort in the left groin and leg. The last 2-mile repeat was definitely a struggle to complete the distance rather than do it at any blistering pace. I came in at 12:30 but was definitely hobbling a bit. I was also soaked from head to tow. The track was 1.5 miles from my home and so I very slowly jogged home with a lingering groin pain that I assumed was some sore of muscle strain. After getting home and warming up my body temperature the discomfort went away for the most part except at times climbing stairs, deep squats or any sort of running motion when bring my left leg forward in swing phase. I reduced my running for a bit and although I didn’t feel real strong going into the Boston Marathon I didn’t have any pain on race day. Following the race, I again had some of the discomfort that I had during the long track workout but it subsided after time off from running. HANGING OUT BEFORE THE 2017 BOSTON MARATHON WITH CLIF BAR TEAMMATE AND ULTRA RUNNING LEGEND SCOTT JUREK AND HIS NEW BABY. 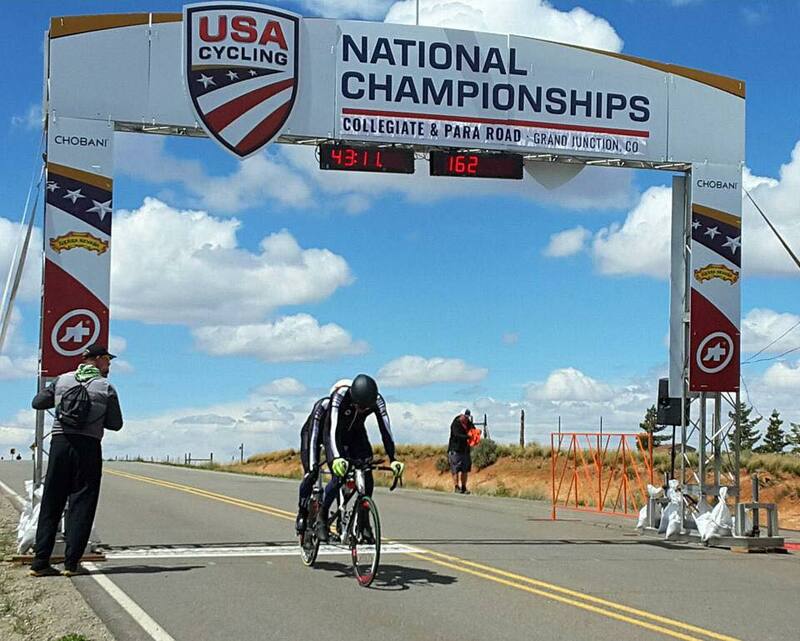 Two weeks following the Boston Marathon, I was set to do the US ParaCyling National Championships in Grand Junction, CO with a friend and strong cyclist Paul Thomas. My legs were still lethargic leading up to and in the time trial but we had a good race winning by just over 1 minute in the Time Trial. My left leg didn’t bother me for the most part during cycling but if I tried to stand and pull up with my left leg with any force I often noticed the same pain in my groin area. A day after the time trial was the road race which was quite challenging with over 4,000ft of climbing in 60 miles. When riding tandem it can get uncomfortable to stay in one position for a long time but standing also requires a great deal of energy so you want to minimize it as much as possible. With the long climbs of the road race we stood multiple times. During the race I didn’t really feel much in my left side but with the massive adrenaline and my mind in the race I didn’t really notice any discomfort until after the race. Again, the pain was dull but began to linger longer and I began noticing it throughout the entire day. Finishing the time trial at the 2017 ParaCycling National Championships with Paul Thomas as pilot. In June 2017, I saw a sports medicine MD in Seattle and got Xrays but these turned out negative which I expected. I then got an MRI of my left hip and pelvis. Fortunately my hip joint looked perfect with surprisingly no beginnings of arthritis. The area around the adductor longus tendon origin where it attaches to the pelvic bone did light up with inflammation and a fairly severe stress reaction. With the location being a spot that typically has good healing I was told to avoid running but cycling and swimming were fine. For the next four months I did not run other than doing two sprint triathlons, one of which was the Paratriathlon World Championships in Rotterdam, NED. Although I came in second, losing by just ten seconds at World’s. Considering I had run only 2-3 times in three months, I was fairly happy with the result. The male visually impaired class is getting much more competitive and showing up injured with the expectation of winning is no longer a reasonable mindset. Following the World Championships much of my focus was spent on getting ready for the birth of Kennan and then spending many nights getting up throughout the night getting the little man back to sleep. Despite, taking time off of training with the birth of Kennan and literally running five times in six months, I continued to have lingering discomfort in my groin and also noticed pain had begun in my left lower abdominal area just inside my left pelvic bone (ASIS to be exact). I noticed it when cycling but the discomfort for the most part subsided with a proper warm up. The pain was definitely very bothersome and lingering in daily living but it did not really stop me from doing much other than running. It did however limit me significantly in training to maximize my athletic performance. If I was going to compete to win I had to figure out and solve this injury. Together with the sports medicine MD we explored my options as I had already tried the rest option and that didn’t work. The next two treatments that seemed promising were either Platelet Rich Plasma (PRP) or a Cortisone injection. PRP is a newer procedure in which your blood is taken, centrifuged to separate only the platelets into a concentrated solution and then injected back into you at the location of the injury to promote healing. The cortisone is often more of a quick fix and doesn’t typically resolve the problem directly. Cortisone also can have serious side effects that include tendon rupture. I chose to go the PRP route. For the next four weeks I did little to nothing for training but did not notice any change in the symptoms. I then went back to the sports MD and he recommended 4 weeks of non-weight bearing in a wheelchair to ensure that the stress fracture would heel properly. I was lucky in that I currently had a physical therapy student at the time and I was able to continue working while in a wheelchair and supervise the student. The time in the wheelchair was extremely difficult and frustrating as it was the time Kennan was two months old and getting up to make a bottle and rocking a child in a wheelchair when they want you to stand is not exactly easy to do or cope with psychologically. Parents are a great thin to have in these circumstances and thankfully I was able to get some support in this way. Coming off of the four weeks confined to a wheelchair (December 2017), I gradually built back into walking and full weight bearing activity. I began some training but continued to have the lingering discomfort. I then began working with the USOC medical network out of Pittsburgh, PA and I was flown to see a specialist who had a hip and a pelvis specialist look at me before deciding that they really thought that the issue was arising from the pelvis. I was whisked over to the pelvic specialist who assessed me for a sports hernia and then sent me back to the general sports medicine MD who decided to do a Cortisone injection to the adductor tendon/muscle junction. I then immediately boarded a plane back to Seattle. Two weeks went by and I continued to work at my job and stick only to light activity with progression back towards more vigorous to see whether the injection resolved the symptoms. Although there was some relief it was definitely not completely resolved and I decided to continue this long exhaustive journey and follow back up with the MD in Pittsburgh. In March 2018 I would race the CAMTRI Paratriathlon Championships as the points from this race were important for maintaining my national team status and keeping world rankings high. Just a few weeks later I was scheduled for sports hernia surgery in Pittsburgh, PA. Just my luck that week I got sick with a cold and the surgery was pushed back until the beginning of April. On the first Friday of April 2018 I underwent laparoscopic sports hernia surgery in Pittsburgh, PA. The sports hernia path was kind of a last ditch effort to resolve the problem as this diagnosis is often one of exclusion. The diagnosis of sports hernia is a patchwork diagnosis that can be associated to multiple different impairments. Most commonly it is seen as a weakening in the walls in one’s lower abdomen and pelvis. The surgeon reported that the procedure went well and he reinforced the area where the rectus abdominus meet up with the adductor (groin) muscles on my left side. The first week following the surgery was slightly rough as I basically felt as though I was kicked in the groin/abdomen by a donkey, but I managed to avoid taking any pain medications other than Ibuprofen. Four days after the surgery I flew back to Seattle with light to no exercise and no lifting greater than fifteen pounds for 6-8weeks. This is nearly impossible when you have a seven month old baby that weighs 15-17lbs. I did my best to follow MD orders as I am the one every day at work reinforcing the importance to my patient’s of following their own personal precautions. I will say I did pick up my child a few times in those first six weeks but that would nearly be a crime not to have done so. Luckily, my employer allowed me to return to week a week after my surgery on light duty as financially I don’t know if we could take the hit for me not to work. Over the eight weeks of limited activity, I continued to have discomfort in my lower abdomen but it was different than prior to surgery and I attributed it all to the healing process and scar tissue being tugged on. At eight weeks I began getting myofascial work done on my abdomen and training on recruiting the deep muscles of my core. I also began some strengthening my gluteus and quads to prevent my adductor muscles from overworking. I began physical therapy but the chaotic life of working full time, an eight month old boy and the inability to drive it was too difficult to find available appointments. I did begin to swim which may have been the most effective thing I could do to begin engaging the lower abdominal muscles and relaxing the tissue to allow gradual stretching. Swimming also made me very aware that I had seemingly lost total control of my left side core stabilization and neural firing to rotate my hips. I felt like a log that just wanted to continue to float on its right side only. At the beginning of June 2018, I returned to light cycling on the trainer. It was somewhat odd as I didn’t feel much of any discomfort from the surgery when first returning to cycling but then went through periods of intermittent discomfort. This kind of messed with my head as I kind of questioned whether the surgery was effective. The surgeon reassured me to be patient and not make any judgments until 12 weeks post surgery. This didn’t give me a lot of reassurance as I had scheduled my return to racing 14 weeks post surgery on July 28that the ITU WTS Edmonton race. It was mid June when I ran for the first time in nearly four months. I began by doing multiple run/walk cycles starting 3min on/1min off for up to 20minutes. The first few times I ran I didn’t have any discomfort at my surgical site but boy was I out of run shape and were my legs lethargic the next day. My coach Mark Sortino and I began increasing the intensity in all areas in the swim, bike and run but as I began including high intensity efforts especially in the swim and run I began to again have pain in my lower abdomen. The preparation and return to racing truly was a puzzle in which the pieces were constantly being moved to find the exact combination. By the middle of July I was still only running a few times per week but was incorporating some tempo and speed on the run. Multiple times though I had set backs where I either began to have pain near the end of a faster run or have lingering discomfort for a few days following. This meant more juggling around and limitation to the discipline that needed the most focus. Despite knowing that I was probably only 60%of maximal fitness, I stuck to my plan to return to racing at the ITU WTS Edmonton race. This race includes a challenging hill that we normally complete four times over the 20K bike course but this year as a result of road work and unforeseen events the course was modified to six times up and down the large hill. This meant that the bike course was literally six hill repeats. The run course was not a challenging course but after six times up the hill you definitely feel it in the legs. The Edmonton race is one of the five major series races on the international level but the field was not as strong as some of the international races where the Europeans comprise the bulk of the top competitors. There were however a few good athletes in my category and when you are out of racing for many months you can never know how much better your competition has gotten. Many of you probably know the result of my return in Edmonton. It was not Gold but the race kind of went how I expected it to go. I went out in the swim and blew up on the second half as I lacked the endurance. The hill on the bike zapped my energy more so then ever before and I never felt as though I got into a rhythm over top of my pedals. The run was just a survival fest as my legs were heavy and sloppy and I felt as though I have no power to drive my left leg forward. I was passed on the second lap of the run by a great runner from Australia Jonathon Goralach who surprised me out of nowhere with his improvements in the swim and bike. This result was humbling as it is difficult knowing psychologically you are present but physically your body just won’t respond. I was not happy with Silver in Edmonton but it was at least a good start to my come back. The next race was the ITU Paratriathlon World Championships in Gold Coast Australia and I would have to have a much beter performance and be much more fit than at the race in Edmonton as all of the top guys would be there.